Finite Element Model of MscL, a bacterial channel. This figure is similar to that in Tang et al. Mechanosensitive channels, mechanosensitive ion channels or stretch-gated ion channels are membrane proteins capable of responding to mechanical stress over a wide dynamic range of external mechanical stimuli. They are present in the membranes of organisms from the three domains of life: bacteria, archaea, and eukarya. They are the sensors for a number of systems including the senses of touch, hearing and balance, as well as participating in cardiovascular regulation and osmotic homeostasis (e.g. thirst). The channels vary in selectivity for the permeating ions from nonselective between anions and cations in bacteria, to cation selective allowing passage Ca2+, K+ and Na+ in eukaryotes, and highly selective K+ channels in bacteria and eukaryotes. All organisms, and apparently all cell types, sense and respond to mechanical stimuli. MSCs function as mechanotransducers capable of generating both electrical and ion flux signals as a response to external or internal stimuli. Under extreme turgor in bacteria, non selective MSCs such as MSCL and MSCS serve as safety valves to prevent lysis. In specialized cells of the higher organisms, other types of MSCs are probably the basis of the senses of hearing and touch and sense the stress needed for muscular coordination. However, none of these channels have been cloned. MSCs also allow plants to distinguish up from down by sensing the force of gravity. MSCs are not pressure-sensitive, but sensitive to local stress, most likely tension in the surrounding lipid bilayer. MS can be classified based on the type of ion to which they are permeable. Cation Selective MSCs: As the name suggests, they exhibit a selective permeability for positive ions with the most selective channels being those for K+. The most common eukaryotic MSCs are cation selective passing Na+, K+ and Ca2+ but not Mg2+. 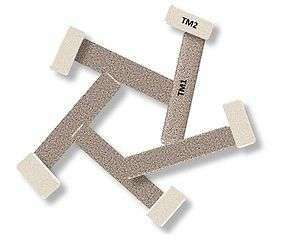 They have a single channel conductance range (25-35 pS) and they are blocked by trivalent ion Gadolinium. The K+ selective MSCs such as TREK-1 are not blocked by Gd3+. Anion Channels: they exhibit a significant permeability for negative ions, and are not predominant as cation MS. They have a large conductance range (> 300pS). Non Selective ion channels: As the name indicates, they do not differentiate between positive and negative channels those are more common to Archaea and Bacteria, but rarely found in Eukarya. For a protein to be considered mechanosensitive, it must respond to a mechanical deformation of the membrane. Mechanical deformations can include changes in the tension, thickness, or curvature of the membrane. Mechanosensitive channels respond to membrane tension by altering their conformation between an open state and a closed state. One type of mechanically sensitive ion channel activates specialized sensory cells, such as cochlear hair cells and some touch sensory neurons, in response to forces applied to proteins. Stretch-activated ion channels are of use in the initial formation of an action potential from a mechanical stimulus, for example by the mechanoreceptors in an animal's vibrissae (whiskers). Afferent nerve fibers responsible for sensory stimulus detection and feedback are especially sensitive to stimulation. This results from the specialized mechanoreceptor cells that are superimposed upon the afferent nerve fibers. Stretch-activated ion channels are located on these mechanoreceptor cells and serve to lower the action potential threshold, thus making the afferent nerves more sensitive to stimulation. Afferent nerve endings without mechanoreceptor cells are called free nerve endings. They are less sensitive than the encapsulated afferent fibers and generally function in the perception of pain. Stretch-activated ion channels are responsible for many bodily functions in mammals. In the skin they are responsible for sensing vibration, pressure sensation, stretch, touch, and light touch. They are expressed in sensory modalities including taste, hearing, smell, heat sensation, volume control, and vision. They can also regulate internal functions of our body including, but not limited to, osmotic pressure in cells, blood pressure in veins and arteries, micturition, and heart contractility. In addition to these functionalities, stretch-activated ion channels have also been found to be involved with balance and proprioceptive sensation. Channels that have traditionally been known as just “voltage-“ or “ligand-gated” have also been found to be mechanically sensitive as well. Channels exhibit mechanical sensitivity as a general property. However, mechanical stress affects various types of channels in different ways. Voltage and ligand gated channels can be modified slightly by mechanical stimulation, which might change their responsiveness or permeability slightly, but they still respond primarily to voltage or ligands, respectively. The different families of stretch-activated ion channels are responsible for different functions around the body. The DEG/ENaC family consists of two subgroups: the ENaC subfamily regulates Na+ reabsorption in kidney and lung epithelia; the ASIC subfamily is involved in fear conditioning, memory formation, and pain sensation. The TRP superfamily of channels are found in sensory receptor cells that are involved in heat sensation, taste, smell, touch, and osmotic and volume regulation. MscM, MscS, and MscL channels (mechanosensitive channels of mini, small, and large conductance) regulate osmotic pressure in cells by releasing intracellular fluid when they become too stretched. In the body, a possible role in myoblast development has been described. Furthermore, mechanically gated ion channels are also found in the stereocilia of the inner ear. Sound waves are able to bend the stereocilia and open up ion channels leading to the creation of nerve impulses. These channels also play a role in sensing vibration and pressure via activation of Pacinian corpuscles in the skin. There are two different types of stretch-activated channels between which it is important to distinguish: mechanically gated channels, which are directly influenced by mechanical deformations of the membrane, and mechanically sensitive channels, which are opened by second messengers released from the true mechanically gated channel. Two different mechanisms have been found to open stretch-activated ion channels: Mechanical deformations in the cell membrane can increase the probability of the channels opening. Proteins of the extracellular matrix and cytoskeleton are tethered to extra - and intra-cytoplasmic domains, respectively, of the stretch-activated ion channels. Tension on these mechanosensory proteins causes these proteins to act as a signaling intermediate, resulting in the opening of the ion channel. All known stretch-activated ion channels in prokaryotic cells have been found to be opened by direct deformation of the lipid bilayer membrane. Channels that have been shown to exclusively use this mechanism of gating are the TREK-1 and TRAAK channels. In studies using mammalian hair cells, the mechanism that pulls on proteins tethered from the intra- and extra-cytoplasmic domain of the channel to the cytoskeleton and extracellular matrix, respectively, is the most likely model for ion channel opening. Prokaryotic model. Channel opens in response to membrane deformation (green arrows). Adapted from Lumpkin et al. Mammalian hair cell model. Channel opens via tethers in response to a disturbance in either the extracellular matrix or cytoskeleton. Figure adapted from Lumpkin et al. ^ a b Lumpkin EA, Caterina MJ (February 2007). "Mechanisms of sensory transduction in the skin". Nature. 445 (7130): 858–65. doi:10.1038/nature05662. PMID 17314972. Although MS vary in many aspects, structures and functions, all the MS studied to date share an important feature: in a process called gating, they all open in a pore-like manner when protein channels are activated by a mechanical stimulus. There are currently two models of the gating process that explain how membrane-activated ion channels open. Gating Mechanism of MS.Stretch activated model, tension in the lipid bilayer triggers conformational changes which open the channel. Figure adapted from Lumpkin et al. Lipid bilayer Tension or stretch model: In this model tension in the lipid bilayer triggers conformational changes, thus leading to the opening of the channels. The tension perceived by the protein comes from the lipids. It has been demonstrated that the tension/stretch profile in the lipid bilayer is originated by membrane curvature and bilayer-protein hydrophobic mismatch. Gating Mechanism of MSC:Spring-like tether model - The tethers are attached to the channel proteins and are connected to the cytoskeleton. The tethers act like spring mechanisms of a shutter. Figure adapted from Lumpkin et al. Spring-like Tether model: In this model a spring-like tether is attached directly to the MS channel and can be present in either the cytoskeleton or the extracellular matrix linking these elements together. When external stimuli deflect the tether the displacement opens the channel. This particular mechanism has been demonstrated to be the responsible for gating hair cells which are responsible for hearing in vertebrates. Bacterial MS channels were first discovered by patch-clamp experiments in E. coli. They have been classified based on their conductance as mini (MscM), small (MscS) and large (MscL). These channels function in tandem-mode and are responsible of turgor regulation in bacteria; when activated by changes in the osmotic pressure. MscM is activated first at really low pressures followed by MscS, and finally MsCL being the last chance of survival during osmotic shock. Their task was demonstrated when bacteria missing both MscS and MscL was lysed after exposure to osmotic downshocks. MscS: Small conductance mechanosensitive channel. The main conductance is 1nS in buffer solution. 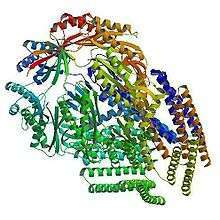 Channel-proteins have been found in gram positive and gram negative bacteria, archaea and plants. MscS channel was found after studies in E. coli spheroplasts. The identification of the gene family necessitated for MS of small conductance was as two different channels. YggB encoding MscS and KefA encoding MscK in E. coli further confirm its role osmotic regulation. Mutagenesis studies showed that when both genes YggB and KefA were deleted MscS lost its function, but maintain MscL and MscM, but mutants deficient of YggB and MscL showed that the function of those channel is to open in respond to pressure range right before cell rupture. The 3D structure of this channel at closed state was elucidated after the crystallography study by Bass et al. which showed that at resolution of 3.9 Å this 31kDa protein is an homoheptamer forming a channel with 80 Å of diameter and 120 Å in length, each subunit contains three transmembrane domains (TM1, TM2, and TM3) with the N-terminal facing the periplasm and the C-terminal embedded in the cytoplasm. The TM3 is highly conserved in MscS family and it is thought to play an important role in MS prokaryotic gating. MscS is a small protein composed of 286 amino acid residues activated by both tension in the lipid bilayer and voltage; in 2002 Vasquez et al. detailed this process and showed that during the change from closed state to open state the TM1 tilt and rotate making TM2 being exposed to the membrane and the TM3 helices expand, tilt, and rotate. During the rearrangement the confined part of the pore was measured as 11 Å, and water molecules were more accessible to the TM3. The two transmembrane domains are in continuous contact with the lipid bilayer and are thought to be the sensor for the tension in the lipid bilayer as well as sensor for voltage because of the three arginine residues present in those domains. Although MscS is activated by voltage it has been demonstrated that, voltage itself is insufficient to open the channel, thus functioning in a cooperative manner with the channel. The more positive voltage, the higher the probabilities of opening the channel as long as pressure over the threshold is still applied in the system; the performance of this channel at higher voltage has not been completely understood. MscS has a small affinity for negative ions including Cl-, and glutamate. MscL: Large conductance mechanosensitive channel. In bacteria MscL was the first MS channels cloned and sequenced, and is by far one of the most studied channels. The gene encoding MscL protein is trkA and it is located in the inner membrane of the E. coli. The protein is 17 KDa, and consists of 136 amino acids; mostly hydrophobic residues resulting in two hydrophobic segments, however molecular weight of the functional channel is presumed to be 60-70 KDa from gel filtration experiments, suggesting oligomerization. As a common feature no cysteines residues are present in this channel. In 1998 the homolog MscL from mycobacterium tuberculosis Tb-MscL was elucidated at closed state by X ray crystallography at 3.5 Å resolution. The protein is a homopentamer composed mostly of helical regions trans orientation of the helices with respect to the bilayer, with two domains: the cytoplasmic and the transmembrane. The channel is 85 Å in length, 35 Å and 50 Å for the cytoplasmic transmembrane domain respectively and 50 Å in diameter. The helices cross the membrane twice with both the C-terminal and the N-terminal, thus having two transmembrane domains TM1 and TM2 being TM1 the most conserved region among MscL proteins especially at the N-terminal region. It is located in the cytoplasm and forms a α-hydrophobic helix called S1; the region between the transmembrane domains form a loop that is divided into two regions: S2 a glycine-proline rich region and S3 a short helical section. Also interestingly the secondary structure of the protein is resistant to thermal denaturation still in the presence of SDS. During the activation of the prokaryotic MscL by tension in the lipid bilayer an intermediate state was determined. The S1 segments form a bundle when the structure is in the closed state, and the crosslinking of S1 segments prevents the opening of the channel. When tension is applied to the membrane the transmembrane barrel-like structure expand and stretch apart the region S1-TM1 allowing the channel to open. The size of the pore at open state is approximately 25Å. The transition from closed to intermediate state is accompanied by small movements of the TM1; further transitions to the open stated are characterized by big rearrangements in both the TM1 and TM2. The lipid bilayer is an important structure in all living cells; it has many functions such as separation of compartments, and signaling among others. In the case of the prokaryotic protein channels MscS and MscL both are gated by tension in the lipid bilayer, thus suggesting an important role in such a complex structures. The tension in the membrane bilayer has been extensively studied, simple intrinsic properties of the lipids can account for the contributions in the free energy of the open, intermediate, and close state of the MS channels. The bilayer possess different features that allows it to transduce tension and to prevent exhaustive deformations, the first one is “in plane fluidity of the lipid bilayer” meaning that any in plane tension in the lipid bilayer is felt homogenously in the absence of cytoskeleton interactions. The lipid molecules have a specific space in between them, preventing the bilayer from any changes. The contribution of membrane deformation in the gating of MS channels can be divided in two types: the deformation of the plane of the bilayer, and the deformation of the thickness of the bilayer. Also during any process involving changes in the structure, the free energy of the process itself is also an important factor. During gating the major processes that account for this event are: hydrophobic mismatch, and membrane curvature. It has been calculated that the free energy of the tension in the lipid bilayer is similar to the energy needed for gating the channels. A different study showed that the length of the hydrophobic tail affects its functioning as well as supporting the different states, Phosphatidylcholine (PC) 18 stabilizes better the open state of the MscL channel, PC 14 stabilizes the intermediate state, and a mixture of PC 18 and lysophosphatidylcholine (LPC) stabilizes the closed state, suggesting that the bilayer thickness (for carbon tail lengths of 16, 18 and 20) affects channel function. In conclusion the energy from the environment of the membrane plays an important role in the total energy of channel gating. 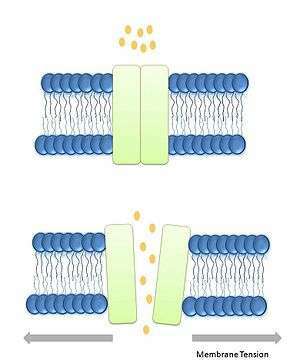 In eukaryotes, two of the best known mechanosensitive ion channels are the potassium channels TREK-1 and TRAAK, both of which are found in mammalian neurons. Recently, a new mechanosensitive ion channel family was cloned, with two mammalian members, PIEZO1 and PIEZO2. Both these channels are expressed in the lungs and bladder, organs with important mechanosensory functions. Piezo1 is also expressed in the skin, and in red blood cells, and its gain of function mutations cause hereditary xerocytosis. Piezo2 is expressed in sensory neurons of the dorsal root and trigeminal ganglia indicating that it may play a role in touch sensation. Mutations in piezo2 are associated with a human disease named Distal Arthrogryposis. MS channels are ubiquitously expressed in the membrane of prokaryotes suggesting their significance. In Bacteria and Archaea the function of these channels is conserved and it has been demonstrated that they play a role in turgor regulation. In Eukarya MS channels are involved in all five senses. The main family is TRP, and one good example is hair cells involved in the hearing process. When a wave of sound deflects the stereocilia, the channel opens. This is an instance of the Spring-like Tether gating mechanism. Recent studies have revealed a new role of mechanosensitive pathways in which naive mesenchymal stem cells are committed to a particular lineage based on the elasticity of its surrounding matrix. MS have also been suggested as a potential target for antibiotics, the reasoning behind this idea is that both McsS and MscL are highly conserved among prokaryotes, but their homologs have not been found in animals making them an exceptional potential for further studies. In mammalian neurons, opening of the ion channels depolarizes the afferent neuron producing an action potential with sufficient depolarization. Channels open in response to two different mechanisms: the prokaryotic model and the mammalian hair cell model. Stretch-activated ion channels have been shown to detect vibration, pressure, stretch, touch, sounds, tastes, smell, heat, volume, and vision. Stretch-activated ion channels have been categorized into three distinct "superfamilies": the ENaC/DEG family, the TRP family, and the K1 selective family. These channels are involved with bodily functions such as blood pressure regulation. They are shown to be associated with many cardiovascular diseases. Stretch-activated channels were first observed in chick skeletal muscles by Falguni Guharay and Frederick Sachs in 1983 and the results were published in 1984. Since then stretch-activated channels have been found in cells from bacteria to humans as well as plants. The opening of these channels is central to a neuron’s response to pressure, often osmotic pressure and blood pressure, to regulate ionic flow in internal environments. Molecular dynamics simulation: determination of the atomic fluctuation of the system. Atomic force Microscopy: mechanical forces of the membrane. Micropipette Aspiration: Pressure to cells. Through experiments performed on the cytoskeleton and extra-cytoplasmic matrix of stretch-activated ion channels, these structures have been shown to play significant roles in mechanotransduction. In one such experiment on adult heart cells, whole cell recordings were taken on cells being squeezed with two pipettes at 1 Hz/1 um. This squeezing produced no current until five minutes in when a large depolarization was observed. Hereafter, the cell became extremely responsive to every compression and gradually decreased sensitivity over the next few minutes. Researchers hypothesized that, initially, the cytoskeleton was buffering the mechanical deformation of the squeezing from the channel. The depolarization at five minutes was the cytoskeleton snapping which subsequently caused the channel to sense the mechanical deformations and thereby respond to the stimuli. Researchers believe that over the few minutes where the channel repaired itself the cytoskeleton must be repairing itself and newly adapting to the squeezing stimuli. There are six known ASIC subunits, ASIC1a, ASIC1b, ASIC2a, ASIC2b, ASIC3, and ASIC4, which have two transmembrane domains, extracellular and intracellular loops, and C and N termini. These ASIC subunits likely form tetramers with varying kinetics, pH sensitivity, tissue distribution, and pharmacological properties. There are seven subfamilies within the TRP superfamily: TRPC (canonical), TRPV (vanilloid), TRPM (melastatin), TRPP (polycystin), TRPML (mucolipin), TRPA (ankyrin), and TRPN (NOMPC-like). TRP proteins typically consist of six transmembrane domains, S1, S2, S3, S4, S5, and S6, with a pore between S5 and S6. 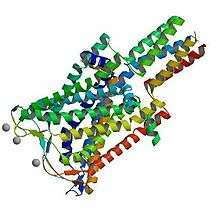 These contain intracellular N and C termini, which form tetramers and vary in length and domain. Within the channel there are ankyrins, which are structural proteins that mediate protein-protein interactions, and are thought to contribute to the tether model of stretch-activated channel opening. NOMPC, identified in D. melanogaster mechanotransduction and a member of the TRPN subfamily, contains a relatively high number of ankyrins. K2P channels consist of six subfamilies and contain four transmembrane domains, which form two pores each between domains 1–2 and 3–4. K2P channels also contain a short N terminal domain and a C terminal which varies in length. There is also a large extracellular linker region between domain 1 and the first pore formed between domains 1–2. The six K2P channel subfamilies are regulated by various physical, cellular, and pharmacological stimulants, including membrane stretch, heat, pH change, calcium flux, and protein kinases. Stretch-activated ion channels perform important functions in many different areas of our body. Pressure-dependent myogenic constriction resistance arteries require these channels for regulation in the smooth muscle of the arteries. They have been found to be used for volume sensing in animals and blood pressure regulation. Bacteria have been shown to relieve hydrostatic pressure through MscL and MscS channels. Stretch-activated ion channels have been correlated with major pathologies. Some of these pathologies include cardiac arrhythmia (such as atrial fibrillation), cardiac hypertrophy, Duchenne muscular dystrophy, and other cardiovascular diseases. Gadolinium (Gd3+) and other lanthanides have been shown to block stretch-activated ion channel function. The peptide toxin isolated from the Chilean rose tarantula (Grammostola spatulata), mechanotoxin 4 (GsMTx4) has been shown to inhibit these channels from the extracellular side, but it does not inhibit all stretch-activated ion channels and particularly has no effect on 2p channels. ↑ Tang, Y.; Cao, G.; Chen, X.; et al. (2006). "A finite element framework for studying the mechanical response of macromolecules: application to the gating of the mechanosensitive channel MscL". Biophys J. 91 (4): 1248–63. Bibcode:2006BpJ....91.1248T. doi:10.1529/biophysj.106.085985. ↑ Sukharev, S.; Sachs, F. (2012). "Molecular Force Transduction by Ion Channels: diversity and unifying principles". J. Cell Sci. 125 (13): 1–9. doi:10.1242/jcs.092353. ↑ Gottlieb, P.; Sachs, F (2012). "The sensation of stretch". Nature. 483 (7388): 163–164. Bibcode:2012Natur.483..163G. doi:10.1038/483163a. PMID 22398551. ↑ Sachs, F. (2010). "Stretch activated Ion Channels; What are They". Physiology. 25 (1): 50–56. doi:10.1152/physiol.00042.2009. PMC 2924431 . PMID 20134028. ↑ Bowman, Charles L.; Gottlieb, P. A.; Suchyna, T. M.; Murphy, Y. K.; Sachs, F. (2007). "Mechanosensitive ion channels and the peptide inhibitor GsMTx-4: History, properties, mechanisms and pharmacology". Toxicon. 49 (2): 249–270. doi:10.1016/j.toxicon.2006.09.030. PMC 1852511 . PMID 17157345. ↑ Suchyna, T. M.; Sachs, F. (2007). "Mechanosensitive channel properties and membrane mechanics in mouse dystrophic myotubes". J Physiol. 581 (Pt 1): 369–387. doi:10.1113/jphysiol.2006.125021. PMC 2075208 . PMID 17255168. ↑ Markin, V. S.; Sachs, F. (2006). "Thermodynamics of mechanosensitivity". Current Topics in Membranes and Transport. 1 (2): 110–124. Bibcode:2004PhBio...1..110M. doi:10.1088/1478-3967/1/2/007. ↑ Pivetti CD, Yen MR, Miller S, Busch W, Tseng YH, Booth IR, Saier MH (March 2003). "Two families of mechanosensitive channel proteins". Microbiol. Mol. Biol. Rev. 67 (1): 66–85, table of contents. doi:10.1128/MMBR.67.1.66-85.2003. PMC 150521 . PMID 12626684. ↑ Kung, C. (2005). "A possible unifying principle for mechanosensation". Nature. 436 (7051): 647–54. Bibcode:2005Natur.436..647K. doi:10.1038/nature03896. PMID 16079835. ↑ Suchyna, T.; Sachs, F. (2007). "Mechanical and electrical properties of membranes from dystrophic and normal mouse muscle". J.Physiol.(Lond). 581 (Pt 1): 369–387. doi:10.1113/jphysiol.2006.125021. PMC 2075208 . PMID 17255168. ↑ Hackney, CM; Furness, DN (1995). "Mechanotransduction in vertebrate hair cells: structure and function of the stereociliary bundle". Am J Physiol. 268: C1–138. ↑ Markin, V. S.; Sachs, F. (2004). "Thermodynamics of mechanosensitivity". Physical Biology. 1 (2): 110–124. Bibcode:2004PhBio...1..110M. doi:10.1088/1478-3967/1/2/007. ↑ Guharay, F.; Sachs, F. (July 1984). "Stretch-activated single ion channel currents in tissue-cultured embryonic chick skeletal muscle". J. Physiol. (Lond.). 352: 685–701. doi:10.1113/jphysiol.1984.sp015317. PMC 1193237 . PMID 6086918. ↑ Guharay, F.; Sachs, F. (1985). "Mechanotransducer ion channels in chick skeletal muscle: the effects of extracellular pH". Journal of Physiology (Lond.). 353: 119–134. ↑ Methfessel, C.; et al. (1986). "Patch clamp measurements on Xenopus laevis oocytes: currents through endogenous channels and implanted acetylcholine receptor and sodium channels". Pflugers Archiv.European Journal of Physiology. 407 (6): 577–588. doi:10.1007/BF00582635. PMID 2432468. ↑ Zhang, Y.; Gao, F.; Popov, V. L.; Wen, J. W.; Hamill, O. P. (2000). "Mechanically gated channel activity in cytoskeleton-deficient plasma membrane blebs and vesicles from Xenopus oocytes". Journal of Physiology. Pt 1. 523 (Pt 1): 117–130. doi:10.1111/j.1469-7793.2000.t01-1-00117.x. PMC 2269789 . PMID 10673548. ↑ Zhang, Y.; Hamill, O. P. (2000). "Calcium-, voltage- and osmotic stress-sensitive currents in Xenopus oocytes and their relationship to single mechanically gated channels". Journal of Physiology (Lond). 523: 83–99. doi:10.1111/j.1469-7793.2000.t01-2-00083.x. ↑ Zhang, Y.; Hamill, O. P. (2000). "On the discrepancy between whole-cell and membrane patch mechanosensitivity in Xenopus oocytes". Journal of Physiology (Lond). 523: 101–115. doi:10.1111/j.1469-7793.2000.00101.x. ↑ Hamill, O. P.; McBride, D. W. J. (1996). "Membrane voltage and tension interactions in the gating of the mechano-gated cation channel in xenopus oocytes". Biophysical Journal. 70: A348. Bibcode:1996BpJ....70..339.. doi:10.1016/S0006-3495(96)79669-8. ↑ Wilkinson, N. C.; McBride, D. W.; Hamill, O. P. (1996). "Testing the putative role of a mechano-gated channel in testing Xenopus oocyte maturation, fertilization and tadpole development". Biophysical Journal. 70: A349. Bibcode:1996BpJ....70..349Z. doi:10.1016/S0006-3495(96)79576-0. ↑ Lane, J. W.; McBride, D. W., Jr; Hamill, O. P. (1993). "Ionic effects on amiloride block of the mechanosensitive channel in Xenopus oocytes". British Journal of Pharmacology. 108: 116–119. doi:10.1111/j.1476-5381.1993.tb13449.x. ↑ Hamill, O. P.; McBride, D. W., Jr (1992). "Rapid adaptation of single mechanosensitive channels in Xenopus oocytes". Proceedings of the National Academy of Sciences of the United States of America. 89 (16): 7462–7466. Bibcode:1992PNAS...89.7462H. doi:10.1073/pnas.89.16.7462. PMC 49730 . PMID 1380158. ↑ Lane, J. W.; McBride, D. W., Jr; Hamill, O. P. (1992). "Structure-activity relations of amiloride and its analogues in blocking the mechanosensitive channel in Xenopus oocytes". British Journal of Pharmacology. 106 (2): 283–286. doi:10.1111/j.1476-5381.1992.tb14329.x. PMC 1907505 . PMID 1382778. ↑ McBride, D. W., Jr; Hamill, O. P. (1992). "Pressure-clamp: a method for rapid step perturbation of mechanosensitive channels. Pflugers Archiv". European Journal of Physiology. 421 (6): 606–612. doi:10.1007/BF00375058. PMID 1279516. ↑ Lane, J. W.; McBride, D.; Hamill, O. P. (1991). "Amiloride block of the mechanosensitive cation channel in Xenopus oocytes". Journal of Physiology. 441: 347–366. doi:10.1113/jphysiol.1991.sp018755. ↑ "Mechanosensitive ion channels in nonspecialized cells". Reviews of Physiology, Biochemistry and Pharmacology: 1–77. doi:10.1007/BFb0004985. ↑ Chemin, J.; Patel, AJ; Duprat, F; Sachs, F; Lazdunski, M; Honore, E (2007). "Up- and down-regulation of the mechano-gated K-2P channel TREK-1 by PIP2 and other membrane phospholipids". Pflugers Archiv-European Journal of Physiology. 455 (1): 97–103. doi:10.1007/s00424-007-0250-2. PMID 17384962. ↑ Honore, E. (2007). "The neuronal background K2P channels: focus on TREK1". Nature Reviews Neuroscience. 8 (4): 251–261. doi:10.1038/nrn2117. PMID 17375039. ↑ Honore, E.; Patel, A. J.; Chemin, J.; Suchyna, T.; Sachs, F. (2006). "Desensitization of mechano-gated K-2P channels". Proceedings of the National Academy of Sciences of the United States of America. 103 (18): 6859–6864. Bibcode:2006PNAS..103.6859H. doi:10.1073/pnas.0600463103. PMC 1458984 . PMID 16636285. ↑ Chemin, J.; Patel, A; Duprat, F; Zanzouri, M; Lazdunski, M; Honoré, E (2005). "Lysophosphatidic acid-operated K+ channels". Journal of Biological Chemistry. 280 (6): 4415–4421. doi:10.1074/jbc.M408246200. PMID 15572365. ↑ Lauritzen, I.; Chemin, J; Honoré, E; Jodar, M; Guy, N; Lazdunski, M; Jane Patel, A (2005). "Cross-talk between the mechano-gated K-2P channel TREK-1 and the actin cytoskeleton". EMBO Reports. 6 (7): 642–648. doi:10.1038/sj.embor.7400449. PMC 1369110 . PMID 15976821. ↑ Maingret, F., Honore, E., Lazdunski, M. & Patel, A. J. (2002) Molecular basis of the voltage-dependent gating of TREK-1, a mechano-sensitive K(+) channel. Biochem.Biophys Res.Commun 292, 339-346 . ↑ Patel, A. J.; Lazdunski, M.; Honore, E. (2001). "Lipid and mechano-gated 2P domain K(+) channels". Current Opinion in Cell Biology. 13 (4): 422–428. doi:10.1016/S0955-0674(00)00231-3. PMID 11454447. ↑ Patel, A. J.; Honore, E. (2001). "Properties and modulation of mammalian 2P domain K+ channels". Trends Neurosci. 24 (6): 339–346. doi:10.1016/S0166-2236(00)01810-5. PMID 11356506. ↑ Maingret, F.; Patel, A. J.; Lesage, F.; Lazdunski, M.; Honore, E. (2000). "Lysophospholipids open the two-pore domain mechano-gated K(+) channels TREK-1 and TRAAK". Journal of Biological Chemistry. 275 (14): 10128–10133. doi:10.1074/jbc.275.14.10128. PMID 10744694. ↑ Patel, A. J.; Honoré, E; Lesage, F; Fink, M; Romey, G; Lazdunski, M (1999). "Inhalational anesthetics activate two-pore-domain background K+ channels". Nat. Neurosci. 2 (5): 422–426. doi:10.1038/8084. PMID 10321245. ↑ Patel, A. J.; Honoré, E; Maingret, F; Lesage, F; Fink, M; Duprat, F; Lazdunski, M (1998). "A mammalian two pore domain mechano-gated S-like K+ channel". The EMBO Journal. 17 (15): 4283–4290. doi:10.1093/emboj/17.15.4283. PMC 1170762 . PMID 9687497. ↑ Coste, Bertrand; Xiao, Bailong; Santos, Jose S.; Syeda, Ruhma; Grandl, Jörg; Spencer, Kathryn S.; Kim, Sung Eun; Schmidt, Manuela; et al. (2012). "Piezo proteins are pore-forming subunits of mechanically activated channels". Nature. 483 (7388): 176–81. Bibcode:2012Natur.483..176C. doi:10.1038/nature10812. PMC 3297710 . PMID 22343900. ↑ Kim, Sung Eun; Coste, Bertrand; Chadha, Abhishek; Cook, Boaz; Patapoutian, Ardem (2012). "The role of Drosophila Piezo in mechanical nociception". Nature. 483 (7388): 209–12. Bibcode:2012Natur.483..209K. doi:10.1038/nature10801. PMC 3297676 . PMID 22343891. ↑ Coste, B.; Mathur, J.; Schmidt, M.; Earley, T. J.; Ranade, S.; Petrus, M. J.; Dubin, A. E.; Patapoutian, A. (2010). "Are Essential Components of Distinct Mechanically Activated Cation Channels". Science. 330 (6000): 55–60. Bibcode:2010Sci...330...55C. doi:10.1126/science.1193270. PMC 3062430 . PMID 20813920. ↑ Gottlieb, P.; Sachs, F. Piezo (2012). "Properties of a cation selective mechanical channel". Channels. 6 (4): 1–6. doi:10.4161/chan.21050. ↑ Gottlieb, P. A.; Sachs, F. (2012). "CELL BIOLOGY The sensation of stretch". Nature. 483 (7388): 163–164. Bibcode:2012Natur.483..163G. doi:10.1038/483163a. PMID 22398551. ↑ Bae, Chilman; Sachs, Frederick; Gottlieb, Philip A. (2011). "The Mechanosensitive Ion Channel Piezo1 Is Inhibited by the Peptide GsMTx4". Biochemistry. 50 (29): 6295–300. doi:10.1021/bi200770q. PMC 3169095 . PMID 21696149. ↑ Dedman, Alexandra; Sharif-Naeini, Reza; Folgering, Joost H. A.; Duprat, Fabrice; Patel, Amanda; Honoré, Eric (2008). "The mechano-gated K2P channel TREK-1". European Biophysics Journal. 38 (3): 293–303. doi:10.1007/s00249-008-0318-8. PMID 18369610. ↑ Sackin, H. (1995). "Mechanosensitive channels". Annu. Rev. Physiol. 57: 333–53. doi:10.1146/annurev.ph.57.030195.002001. PMID 7539988. ↑ Sukharev SI, Martinac B, Arshavsky VY, Kung C (July 1993). "Two types of mechanosensitive channels in the Escherichia coli cell envelope: solubilization and functional reconstitution". Biophys. J. 65 (1): 177–83. doi:10.1016/S0006-3495(93)81044-0. PMC 1225713 . PMID 7690260. ↑ Haswell ES, Phillips R, Rees DC (October 2011). "Mechanosensitive channels: what can they do and how do they do it?". Structure. 19 (10): 1356–69. doi:10.1016/j.str.2011.09.005. PMC 3203646 . PMID 22000509. ↑ Ernstrom GG, Chalfie M (2002). "Genetics of sensory mechanotransduction". Annu. Rev. Genet. 36: 411–53. doi:10.1146/annurev.genet.36.061802.101708. PMID 12429699. ↑ García-Añoveros J, Corey DP (May 1996). "Touch at the molecular level. Mechanosensation". Curr. Biol. 6 (5): 541–3. doi:10.1016/S0960-9822(02)00537-7. PMID 8805263. 1 2 3 Purves, Dale. (2004). Neuroscience. Sunderland, Mass. : Sinauer Associates. pp. 207–209. ISBN 978-0-87893-725-7. 1 2 3 4 5 6 7 8 9 10 11 Del Valle ME, Cobo T, Cobo JL, Vega JA (August 2012). "Mechanosensory neurons, cutaneous mechanoreceptors, and putative mechanoproteins". Microsc. Res. Tech. 75 (8): 1033–43. doi:10.1002/jemt.22028. PMID 22461425. 1 2 3 4 Patel A, Sharif-Naeini R, Folgering JR, Bichet D, Duprat F, Honoré E (August 2010). "Canonical TRP channels and mechanotransduction: from physiology to disease states". Pflugers Arch. 460 (3): 571–81. doi:10.1007/s00424-010-0847-8. PMID 20490539. 1 2 3 4 5 6 7 8 9 López-Larrea, Carlos (2011). Sensing in Nature. New York: Springer Science+Business Media. ISBN 978-1-4614-1703-3. 1 2 3 4 5 6 7 Yin J, Kuebler WM (2010). "Mechanotransduction by TRP channels: general concepts and specific role in the vasculature". Cell Biochem Biophys. 56 (1): 1–18. doi:10.1007/s12013-009-9067-2. PMID 19842065. 1 2 3 Martinac B (2011). "Bacterial mechanosensitive channels as a paradigm for mechanosensory transduction". Cell. Physiol. Biochem. 28 (6): 1051–60. doi:10.1159/000335842. PMID 22178995. 1 2 3 4 5 6 7 8 Sachs F (2010). "Stretch-activated ion channels: what are they?". Physiology (Bethesda). 25 (1): 50–6. doi:10.1152/physiol.00042.2009. PMC 2924431 . PMID 20134028. 1 2 Bianchi L (December 2007). "Mechanotransduction: touch and feel at the molecular level as modeled in Caenorhabditis elegans". Mol. Neurobiol. 36 (3): 254–71. doi:10.1007/s12035-007-8009-5. PMID 17955200. ↑ Formigli L, Meacci E, Sassoli C, Squecco R, Nosi D, Chellini F, Naro F, Francini F, Zecchi-Orlandini S (May 2007). "Cytoskeleton/stretch-activated ion channel interaction regulates myogenic differentiation of skeletal myoblasts". J. Cell. Physiol. 211 (2): 296–306. doi:10.1002/jcp.20936. PMID 17295211. ↑ Zhao Y, Yamoah EN, Gillespie PG (December 1996). "Regeneration of broken tip links and restoration of mechanical transduction in hair cells". Proc. Natl. Acad. Sci. U.S.A. 93 (26): 15469–74. doi:10.1073/pnas.93.26.15469. PMC 26428 . PMID 8986835. ↑ Bell J, Bolanowski S, Holmes MH (January 1994). "The structure and function of Pacinian corpuscles: a review". Prog. Neurobiol. 42 (1): 79–128. doi:10.1016/0301-0082(94)90022-1. PMID 7480788. 1 2 3 Lumpkin, Ellen A.; Caterina, Michael J. (2006). "Mechanisms of sensory transduction in the skin". Nature. 445 (7130): 858–865. Bibcode:2007Natur.445..858L. doi:10.1038/nature05662. PMID 17314972. ↑ Markin, V.S. ; Martinac, B. (1991). "Mechanosensitive ion channels as reporters of bilayer expansion. A theoretical model". Biophys. J. 60 (5): 1120–1127. Bibcode:1991BpJ....60.1120M. doi:10.1016/S0006-3495(91)82147-6. PMC 1260167 . PMID 1722115. 1 2 Perozo, E.; Cortes, D. M.; Sompornpisut, P.; Kloda, A.; Martinac, B. (2002). "Structure of MscL and the gating mechanism of mechanosensitive channels". Nature. 418 (6901): 942–8. Bibcode:2002Natur.418..942P. doi:10.1038/nature00992. PMID 12198539. ↑ Hamill, O.P. ; McBride, Jr (1997). "Induced membrane hypo /hyper mechanosensitivity A limitation of patch-clamp recording". Annu. Rev. Physiol. 59: 621–631. doi:10.1146/annurev.physiol.59.1.621. ↑ Martinac B, Buechner M, Delcour AH, Adler J, Kung C: Pressuresensitive ion channel in Escherichia coli" Proc Natl Acad Sci USA 1987, 84:2297-2301. ↑ Perozo, E.; Rees, D.C. (2003). "Structure and mechanism in prokaryotic mecahnosensitive channels". Current Opinion in Structural Biology. 13 (4): 432–442. doi:10.1016/S0959-440X(03)00106-4. PMID 12948773. ↑ Levina, N.; Totemeyer, S.; Stokes, N. R.; Louis, P.; Jones, M. A.; Booth, I. R. (1999). "Protection of Escherichia coli cells againstextreme turgor by activation of MscS and MscL mechanosensitivechannels: Identification of genes required for MscS activity". The EMBO Journal. 18 (7): 1730–1737. doi:10.1093/emboj/18.7.1730. PMC 1171259 . PMID 10202137. ↑ Bass, R. B.; Strop, P.; Barclay, M.; Rees, D. (2002). "Crystal structure of Escherichia coli MscS, a voltage-modulated and mechanosensitive channel". Science. 29 (5598): 1582–1587. Bibcode:2002Sci...298.1582B. doi:10.1126/science.1077945. PMID 12446901. ↑ Pivetti, C. D.; Yen, M. R.; Miller, S.; Busch, W.; Tseng, Y.; Booth, I. R.; Saier, MH (2003). "Two families of mechanosensitive channel proteins". Microbiol. Mol. Biol. Rev. 67 (1): 66–85. doi:10.1128/MMBR.67.1.66-85.2003. PMC 150521 . PMID 12626684. ↑ Vasquez, V.; Sotomayor, M.; Cordero-Morales, J.; Shulten, K.; Perozo, E. (2008). "A Structural mechanism for MscS gating lipid channels in bilayer". Science. 321 (5893): 1210–14. Bibcode:2008Sci...321.1210V. doi:10.1126/science.1159674. ↑ Bezanilla, F.; Perozo, E. (2002). "Force and voltage sensors in one structure". Science. 298 (5598): 1562–1563. doi:10.1126/science.1079369. PMID 12446894. ↑ Sukharev, S. I.; Blount, P.; Martinac, B.; Kung, C. (1997). "MECHANOSENSITIVE CHANNELS OF ESCHERICHIA COLI: The MscL Gene, Protein, and Activities". Annu. Rev. Physiol. 59: 633–57. doi:10.1146/annurev.physiol.59.1.633. PMID 9074781. ↑ Sukharev, S. I.; Blount, P.; Martinac, B.; Blattner, F. R.; Kung, C. (1994). "A large mechanosensitive channel in E. coli encoded by MscL alone". Nature. 368 (6468): 265–268. Bibcode:1994Natur.368..265S. doi:10.1038/368265a0. PMID 7511799. ↑ Chang, G.; Spencer, R.; Barclay, R.; Lee, A.; Barclay, M.; Rees, C. (1998). "Structure of the MscL homologue from Mycobacterium tuberculosis: a gated mechanosensitive ion channel". Science. 282 (5397): 2220–2226. Bibcode:1998Sci...282.2220C. doi:10.1126/science.282.5397.2220. PMID 9856938. ↑ Blount, P; Sukharev, SI; Moe, PC; Schroeder, MJ; Guy, HR; Kung, C. (1996). "Membrane topology and multimeric structure of a mechanosensitive channel protein". The EMBO Journal. 15 (18): 4798–4805. PMC 452216 . PMID 8890153. ↑ Arkin, IT; Sukharev, SI; Blount, P; KungC, Ching; Brünger, Axel T. (1998). "Helicity, membrane incorporation, orientation, and thermalstability of the large conductance mechanosensitive ion channel from E.coli". Biochim. Biophys. Acta. 1: 131–140. doi:10.1016/S0005-2736(97)00219-8. ↑ Sukharev, S.; Betanzos, M.; Chiang, C.S. ; Guy, H.R. (2001). "The gating mechanism of the large mechanosensitive channel MscL". Nature. 409 (6821): 720–724. Bibcode:2001Natur.409..720S. doi:10.1038/35055559. PMID 11217861. 1 2 Perozo, E.; Cortes, D. M.; Sompornpisut, P.; Kloda, A.; Martinac, B. (2002). "Open channel structure of MscL and the gating mechanism of mechanosensitive channels". Nature. 418 (6901): 942–948. Bibcode:2002Natur.418..942P. doi:10.1038/nature00992. PMID 12198539. ↑ Wiggins, P; Phillips, R (2004). "Analytic models for mechanotransduction: Gating a mechanosensitive channel". Proc Natl Acad Sci U S A. 101 (12): 4071–6. arXiv:q-bio/0311010 . Bibcode:2004PNAS..101.4071W. doi:10.1073/pnas.0307804101. PMC 384697 . PMID 15024097. ↑ Wiggins, P; Phillips, R (2005). "Membrane-protein interactions in mechanosensitivechannels". Biophys J. 88 (2): 880–902. arXiv:q-bio/0406021 . Bibcode:2005BpJ....88..880W. doi:10.1529/biophysj.104.047431. PMC 1305162 . PMID 15542561. ↑ Coste B, Mathur J, Schmidt M, Earley TJ, Ranade S, Petrus MJ, Dubin AE, Patapoutian A (October 2010). "Piezo1 and Piezo2 are essential components of distinct mechanically activated cation channels". Science. 330 (6000): 55–60. doi:10.1126/science.1193270. PMC 3062430 . PMID 20813920. ↑ Zarychanski R, Schulz VP, Houston BL, Maksimova Y, Houston DS, Smith B, Rinehart J, Gallagher PG (August 2012). "Mutations in the mechanotransduction protein PIEZO1 are associated with hereditary xerocytosis". Blood. 120 (9): 1908–15. doi:10.1182/blood-2012-04-422253. PMID 22529292. ↑ Coste B, Houge G, Murray MF, Stitziel N, Bandell M, Giovanni MA, Philippakis A, Hoischen A, Riemer G, Steen U, Steen VM, Mathur J, Cox J, Lebo M, Rehm H, Weiss ST, Wood JN, Maas RL, Sunyaev SR, Patapoutian A (March 2013). "Gain-of-function mutations in the mechanically activated ion channel PIEZO2 cause a subtype of Distal Arthrogryposis". Proc. Natl. Acad. Sci. U.S.A. 110 (12): 4667–72. doi:10.1073/pnas.1221400110. PMC 3607045 . PMID 23487782. ↑ Engler, A.; Shamik, S.; Sweeney, L.; Dishe, D. (2006). "Matrix Elasticity Directs Stem Cell Lineage Specification". Cell. 126 (4): 677–689. Bibcode:2010APS..MAR.Q7003D. doi:10.1016/j.cell.2006.06.044. PMID 16923388. ↑ Hamill, O.P. ; Martinac, B. (2001). "Molecular basis of mechanotransduction in living cells". Physiol. Rev. 81 (2): 685–740. PMID 11274342. ↑ Nguyen, T.; Clare, B.; Martinac, B.; Martinac, Boris (2005). "The effects of parabens on the mechanosensitive channels". Eur Biophys. J. 34 (5): 389–396. doi:10.1007/s00249-005-0468-x. PMID 15770478. ↑ Guharay F, Sachs F (July 1984). "Stretch-activated single ion channel currents in tissue-cultured embryonic chick skeletal muscle". J. Physiol. (Lond.). 352: 685–701. doi:10.1113/jphysiol.1984.sp015317. PMC 1193237 . PMID 6086918. 1 2 Patel A, Sharif-Naeini R, Folgering JR, Bichet D, Duprat F, Honoré E (2010). "Canonical TRP channels and mechanotransduction: from physiology to disease states". Pflugers Arch. 460 (3): 571–81. doi:10.1007/s00424-010-0847-8. PMID 20490539. ↑ Maingret F, Fosset M, Lesage F, Lazdunski M, Honoré E (January 1999). "TRAAK is a mammalian neuronal mechano-gated K+ channel". J. Biol. Chem. 274 (3): 1381–7. doi:10.1074/jbc.274.3.1381. PMID 9880510. ↑ Patel AJ, Honoré E, Maingret F, Lesage F, Fink M, Duprat F, Lazdunski M (August 1998). "A mammalian two pore domain mechano-gated S-like K+ channel". EMBO J. 17 (15): 4283–90. doi:10.1093/emboj/17.15.4283. PMC 1170762 . PMID 9687497. ↑ Nagasawa M, Kanzaki M, Iino Y, Morishita Y, Kojima I (2001). "Identification of a novel chloride channel expressed in the endoplasmic reticulum, golgi apparatus, and nucleus". J. Biol. Chem. 276 (23): 20413–20418. doi:10.1074/jbc.M100366200. PMID 11279057. ↑ Ozeki-Miyawaki C, Moriya Y, Tatsumi H, Iida H, Sokabe M (2005). "Identification of functional domains of Mid1, a stretch-activated channel component, necessary for localization to the plasma membrane and Ca2+ permeation". Exp. Cell Res. 311 (1): 84–95. doi:10.1016/j.yexcr.2005.08.014. PMID 16202999. Perozo, E; Kloda, A; Cortes, DM; et al. (2002). "Physical principles underlying the transduction of bilayer deformation forces during mechanosensitive channel gating". Nature Structural & Molecular Biology. 9: 696–703. doi:10.1038/nsb827. PMID 12172537.